Truth be told, we're all guilty of having a wardrobe that looks a bit like a vintage kilo sale at 5 p.m. When we finally complete that triannual deep wardrobe cleanse, it feels almost cathartic, doesn't it? Without sounding dramatic, having a storage space that's organised to the nines really makes you feel like you have your life together. We brought you the best IKEA wardrobes to buy and coolest wardrobe gadgets, but now we're thinking about the wardrobe storage ideas to streamline your space. Whether you have the luxury of a walk-in (we're jealous) or are operating on a one-in-one-out basis (all too relatable), there are plenty of nifty solutions to help out. From ingenious clothes folders to fancy storage boxes and the best wall hangs in the biz, we've got you covered. Keep scrolling and thank us later. This contraption may look a bit daunting at first glance, but it's actually super practical and easy to use. Songmics Flip and Fold is used to fold clothes the same size, hence saving space. It even includes holes to compress the air of those heavier clothes. Great for those who equate shirt-folding to origami. There's nothing revolutionary about hanging storage compartments, but they're endlessly helpful nonetheless. Instant shelves for your clothes, just like that. One for the those short on space, this foldable wall hanger fits snuggly inside (or outside) your wardrobe and can be opened up when you simply don't have enough rail space. Likewise, it can be folded flush just as easy. Even the cleanest wardrobes can come under attack from moths who feed on your finest clothes. Banish them with these cedarwood repellents. Isn't it a bummer when you notice creases in your favourite pair of boots? Luckily, these shoe contraptions are designed to help them keep their shape. Just slot them in between wears and physics will do the rest. For extra storage that doesn't compromise on chicness, look to Oliver Bonas's grid shelves. Would you look at that copper? Proof that the most simple inventions can be the most effective, this multiuse hanger is sure to solve your accessory woes. Hang up your belts, ties, scarves and simply hang it inside your wardrobe or on the back of your door. Life hack: Knee-high boots take up a lot less space when hung as opposed to stored on their soles. Leave your shoe shelf for your heels and hang your boots from above with these nifty hangers. Now just pretend the boots in the photo are by Gianvito Rossi. For those who thrive on order, these shelf dividers might just make your life complete. Simple but effective, this H&M Home wall tidy can be used to store anything from scrunchies to socks. If you're guilty of owning one too many crew necks, then this gadget might be for you. This shirt folder not only helps your store your beloved T-shirts, but it's also great for space-saving and won't have you reaching for the iron every morning. This gold West Helm clothes hook is as chic as it is handy. Pop it on the back of your wardrobe (or your bedroom door) and start stacking your coats, brollies and more. Sometimes you just need that little extra lighting to illuminate your finer things. Enter Cynthia's motion-sensor LED light, which switches on as you open your wardrobe door. Smart. 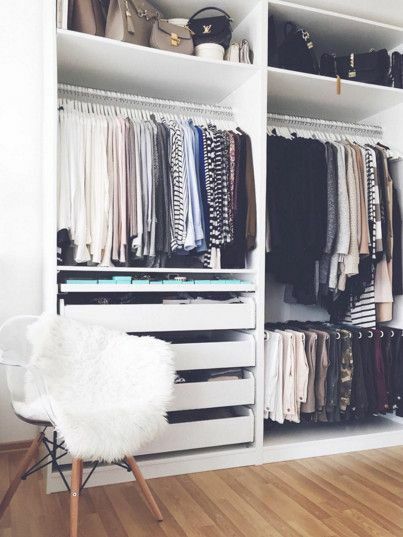 If you're starting from square one and are in need of a wardrobe, consider IKEA's Platsa, which contains multiple shelves, rails and trays for all of your gear. If you've exhausted all space in your wardrobe, this simple stand can squeeze nicely into the corner of your bedroom. Now just start piling on the hats and coats. Next up, explore the Best Wardrobes in Britain.